A rich vegetarian dish, these avocado, bell pepper, and caramelized onion enchiladas are spiced with roasted Hatch chiles and covered in plenty of cheese. My New Years Resolution to add more avocados to my life continues. [Ya think, since I've posted 2 avocado appetizers in the past month or so?] 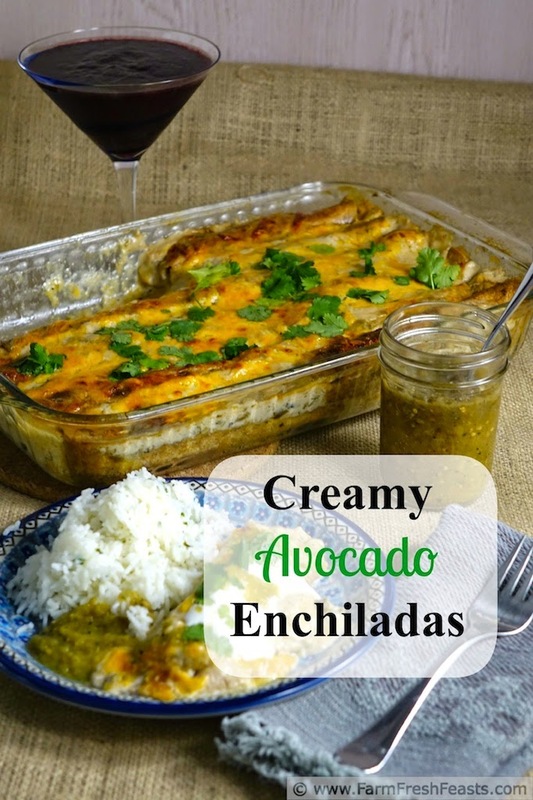 Since we like enchiladas I wondered about using avocado as the filling for a vegetarian dish. Low fat or skinny this is not--it is rich! 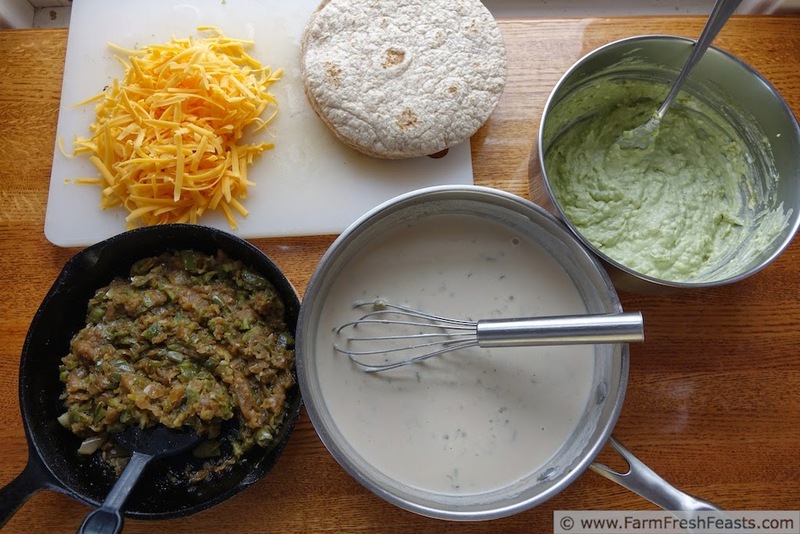 Instead of a tomato-based enchilada sauce like I've used most recently in Confetti Turkey Enchiladas, or a tomatillo-based salsa verde, like in my Fish Taco Enchiladas, I made a spicy white sauce with Hatch chiles. 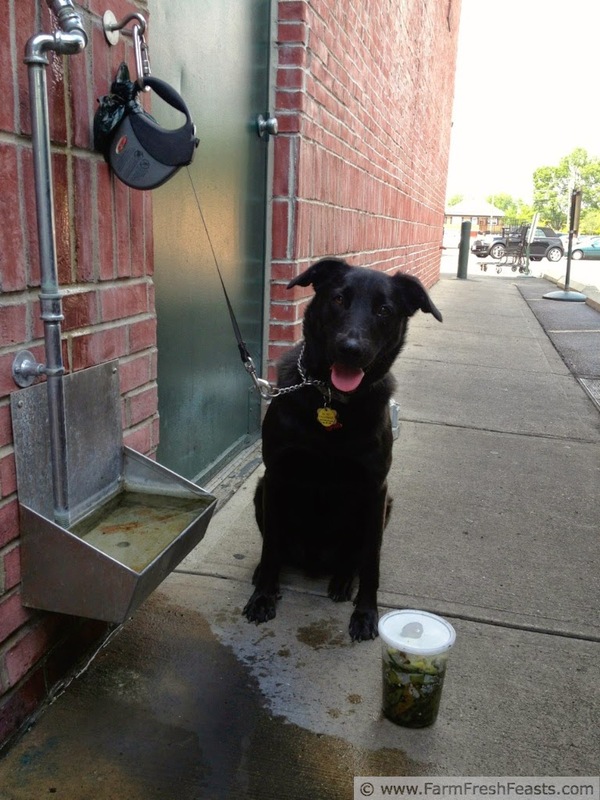 Simon and I walked down to fetch freshly roasted Hatch chiles last summer. In this dish I used bell peppers from my Community Supported Agriculture (CSA) farm share plus roasted Hatch chiles from my local grocery store. Both of these peppers can be frozen when they are harvested and thawed for using in baked dishes like I've shown here. It's another way I feed my family local foods all year long. The caramelized onions are also freezer-friendly flavor boosters. I use both Dorothy's Slow Cooker Method or Alanna's Flavorful Slow Cooker Onions. This is an involved dish, with multiple steps, so I'll skip any further chitchat and get to the chopper recipe. Wait--one note--next week I'll share my recipe for the Cheater Margarita Smoothies shown in several of the photos. 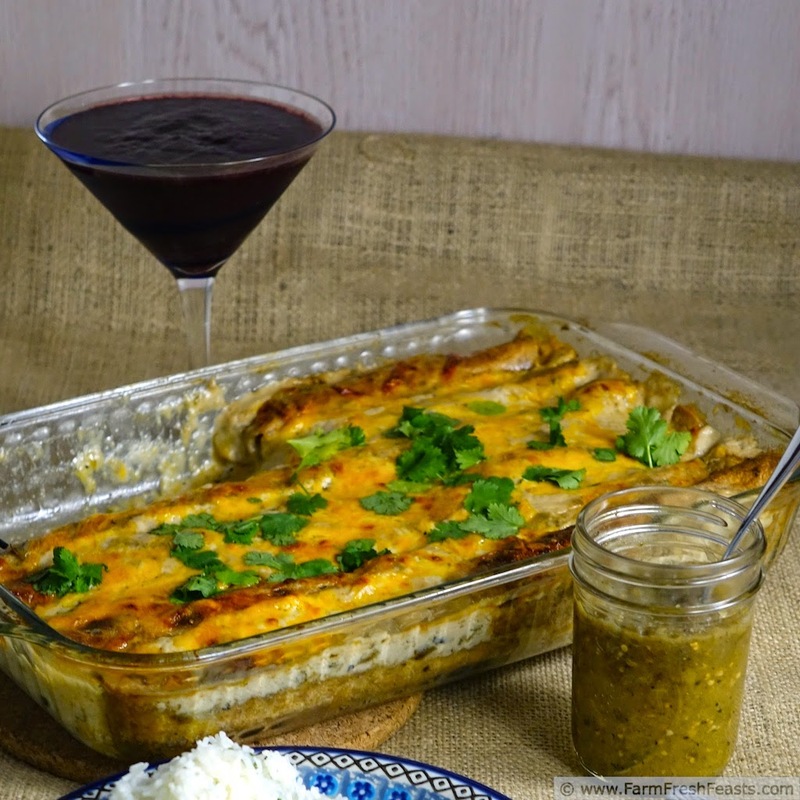 I rarely suggest wine pairings with my recipes, but I can say with confidence that a Cheater Margarita Smoothie--or two--goes well with these enchiladas. 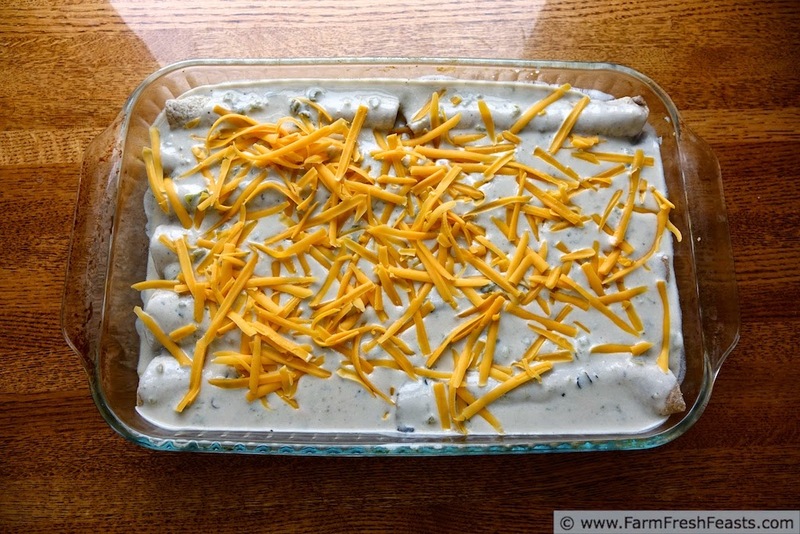 Another note--if you want to boost the structure of these enchiladas, feel free to add 1 or 2 cups of cooked grains (rice, faro, quinoa, etc) to the vegetable filling. We ate ours with rice on the side. For more enchilada ideas, vegetarian or with fish, chicken, or pork--hey, no beef, yet, huh--please enjoy my newest Clickable Collage of Recipe Suggestions below. As always, Anyonita taught me this party trick via this tutorial. Click on the top 6 photos to be taken to the recipe, the bottom row are "coming soon"! For more recipes using Avocados, please see my Avocado Recipes Collection. 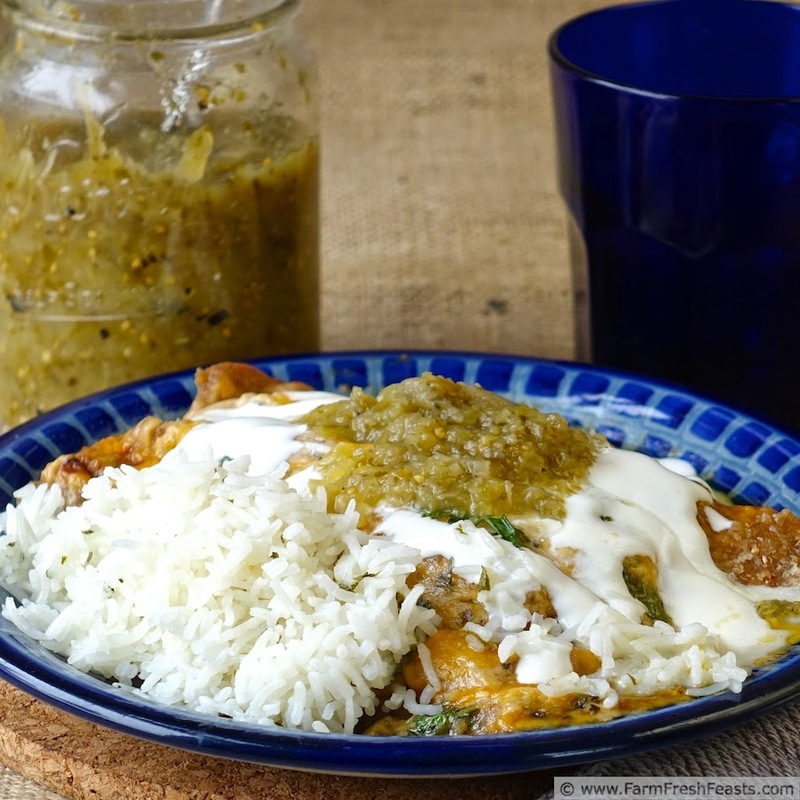 For more recipes using Hatch chiles, please see my Hatch chile Recipes Collection. For more recipes using bell peppers, please see my Pepper Recipes Collection. These collections are part of the Visual Recipe Index by Ingredient, a resource for folks like me eating from the farm share, the farmer's market, the garden, the neighbor's garden, and great deals on ugly produce at the grocery store. Preheat oven to 375 degrees Fahrenheit. You'll need a 13x9 inch pan in a little while, and your clean up will be easier if you spray it with a vegetable oil spray. In a large bowl, mash and stir the avocado with the cream cheese, ½ teaspoon salt, and salsa verde. Set aside. In a large skillet, preheat cooking oil over medium heat and sauté bell pepper until softened, about 5 minutes. Stir in caramelized onions, garlic, and another ½ teaspoon salt. Remove from heat. In a large saucepan, melt butter over medium heat. Stir in flour and cook until browned, 8-10 minutes, then add stock and another ½ teaspoon salt. Bring to a simmer and stir occasionally until thickened into sauce, 8-10 minutes. Turn off heat and stir in Hatch chiles and crema or sour cream. This is your white sauce. To assemble the enchiladas, dump the sautéed vegetables from the skillet into the avocado mixture and combine. This is your vegetable filling. Place ½ cup of white sauce in the bottom of a 13 x 9 pan. 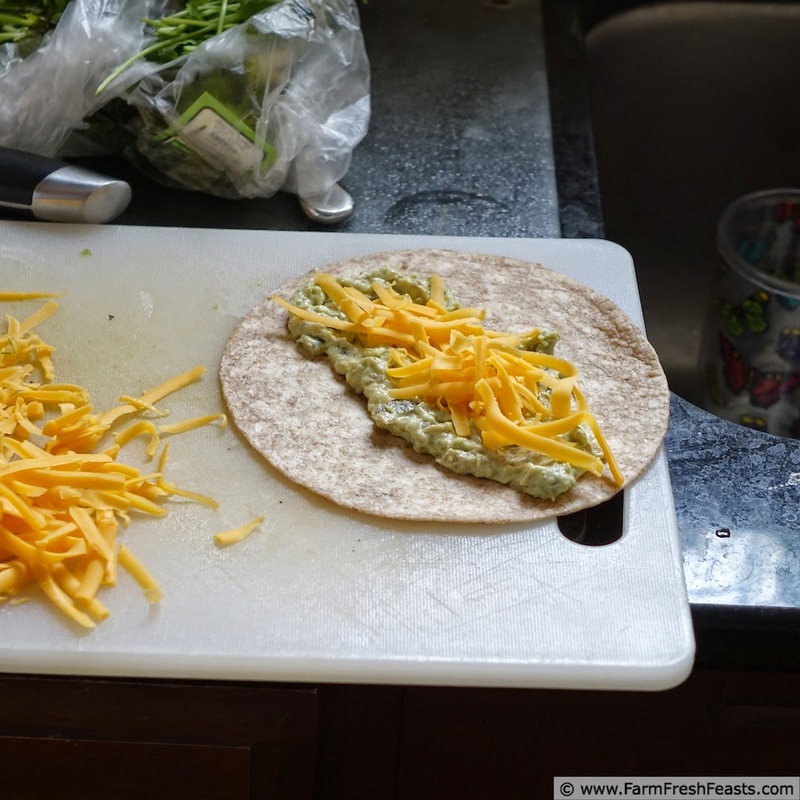 Spread about ⅓ to ½ cup of the vegetable filling down the center of a tortilla, roll it up, and place it in the pan. Repeat until you've run out of tortillas, filling, or room in the pan. Pour the sauce over top of the rolled tortillas, then top with cheese. At this point the dish can be covered and will hold for several hours in the refrigerator if necessary. Bake, uncovered, for 35-45 minutes until the sauce is bubbly, the cheese is melted, and the edges of tortilla peeking up through the sauce are crispy. If you're out of soft tortillas this would also be a good dip to dig in with chips. Delicious offering for Fiesta Friday Kristen! 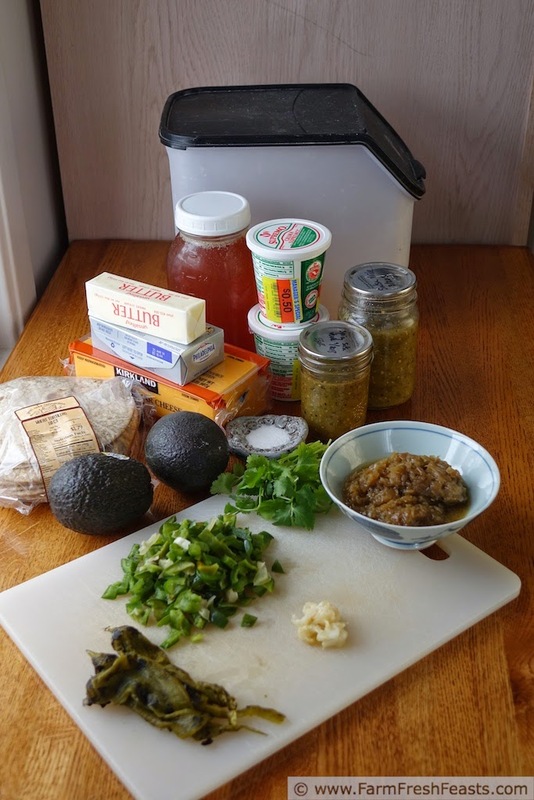 Love avocados in all it's forms and this enchilada recipe sounds like a winner! Yummy photos too. Thanks for sharing your recipe. I appreciate your sweet words! I was thinking this would be an appropriate offering for Fiesta Friday. The more I eat avocados, the more I love their versatility--though I don't know if I'll be making chocolate avocado pudding any time soon. Hating avocados? I'm glad you've seen the light! Boy if the avocado tree my parents started from a pit--which is years old but has never produced anything--ever started bearing fruit I'd be in heaven. Avocado heaven. This is a pretty tasty dish--but I hope you tell folks what's in it at some point. It's too good to keep under wraps! There are truly worse things than eating avocados and drinking margaritas, I am sure. I suppose I should change the blog name--something to the effect that I'm just gonna brainwash you? These Aren't The Farm Fresh Feasts You're Looking For? I have a weakness for Enchiladas and love both avocados and anything with Hatch chilies. This sounds incredible! I have a weakness for the Reese's cups in the Easter candy jar, and I'll be delighted when they've been eaten up. By me or someone else, as long as they are gone I don't mind a bit. They tease me every time I walk by. But that's not here nor there. 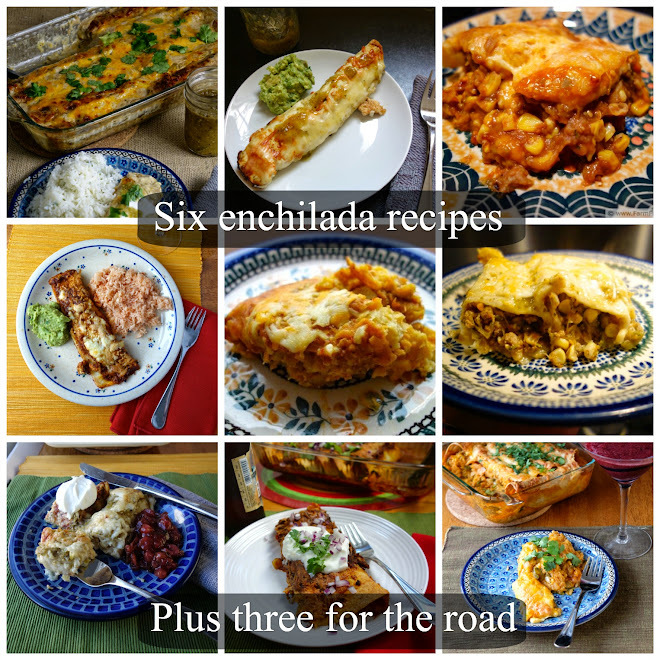 Enchiladas--yep, love 'em too, as evidenced by the collage of so many recipes. What an excellent resource you have. I'm fortunate to be able to walk my dog down to the local grocery store where the big roaster is full of Hatch chiles one weekend in August, and I usually stock up then. I'm glad to know you ship fresh chiles at harvest and have frozen roasted chiles for folks who don't have the terrific local grocery store like I do. I'm an avocado fan, too--it's just such a versatile veggie. Okay, you know these are right up my alley! Avocados + hatch chiles + enchiladas = Yes, please! Aww, thanks! Simon is such an endearing dog I couldn't resist taking his photo with the chiles. It's trickier now, walking 3 dogs down to the grocery store (and Wee Oliver Picklepants' legs give out about ⅔ of the way there) but with judicious carabiner use it works. My family loves enchiladas. I make an avocado cream version one that they all love, but I am always up for trying new versions. These look delicious! And I can't wait for our CSA to start so I can start getting my farm fresh veggies again! Visiting from Tasty Tuesdays! I think I spend the entire month+ before the CSA season starts thinking 'I can't wait for ____' and swapping this that or the other veggie to fill the blank. Right now it's beet greens, and I want to try and make a pico de gallo with radishes--though that will probably happen later with fall radishes and still going strong summer tomatoes and peppers. This sounds fabulous! Thanks for linking up with What's Cookin' Wednesday! They were totally yummy. I'm not yet topped out of avocados, though lately I've been pushing the limits. Congratulations!! Your recipe has been featured at Tasty Tuesdays 58 on my blog, Lori’s Culinary Creations. Hop on over and grab a feature button and link up your latest culinary creations. Congrats again. Thanks for the feature--much appreciated! I love Salsa Verde!! This looks wonderful. Thanks for a great dinner idea! I love it too--and I'm glad I've taken photos of how many jars I put up last summer, so I can make sure to exceed production this season. I've only got a few left, and it's months until the tomatillos and Hatch chiles come my way!